The Dolomites are a part of the Alps that consists mainly of limestone (dolomite). While the central Alps consist of granite and are very massive, the southern and northern edges of the alps consist of limestone, which weathers differently, and which results in mountains with more rugged shapes. We hiked a medium-sized mountain near Sankt Lorenzen (St.Lorenzo), the Piz da Peres, with a height of approximately 8,200 feet. Lower down on the slopes are tiny villages surrounded by meadows and forests. 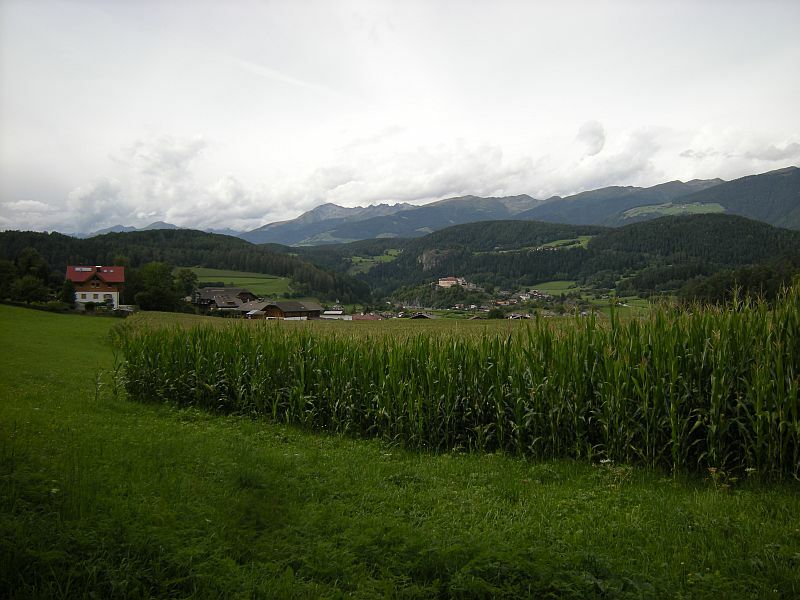 The valleys contain some larger towns and villages, roads and railways, as well as countless farms that benefit from fertile soil and a mild climate. In the cities, like here in Bozen (Bozano), bikes are a popular means of transportation. Life seems very romantic in these tiny villages, with their old churches, farm houses, and gardens full of fruit trees, vegetables, and flowers. Some gardens are surrounded by beautiful old walls and fences. Even newer houses are often built in the traditional style that connected the living quarters with the barn and the stables all under one roof. Many houses have solar installations on their roofs and firewood stored on the side of the building - makes for lower energy bills! What a different world it is up in the mountains, where the clouds pass slowly by and the villages down below look like part of a lovely and peaceful fairy tale landscape. 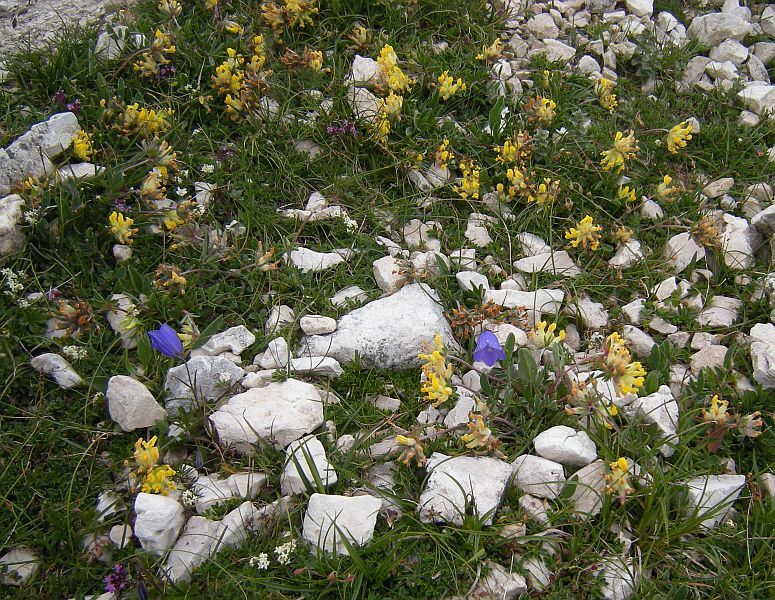 Starting on the lower slopes, we find some stately perennials that are typical for rich alpine meadows. 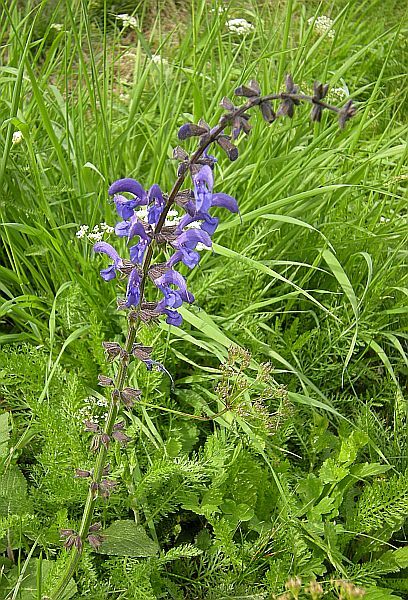 Other than grasses and red and white clover we find Meadow Sage (Salvia pratense). Other common plants are Pincushion flower (Knautia arvensis) and Succisa pratensis, both members of the Dipsacaceae. Silene vulgaris is common in rich, moist meadows. 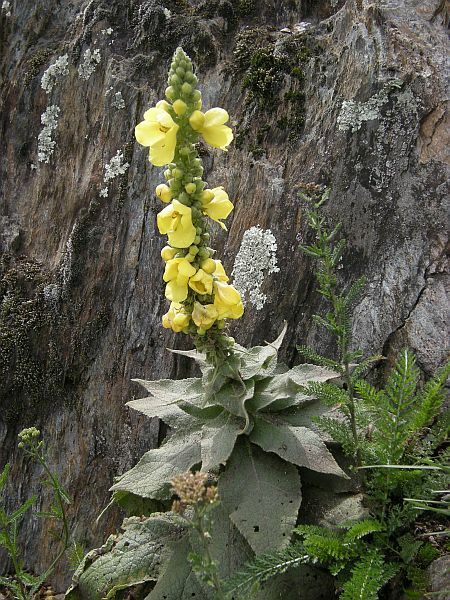 Verbascum densiflorum, an old medical plant, is found in dryer locations. 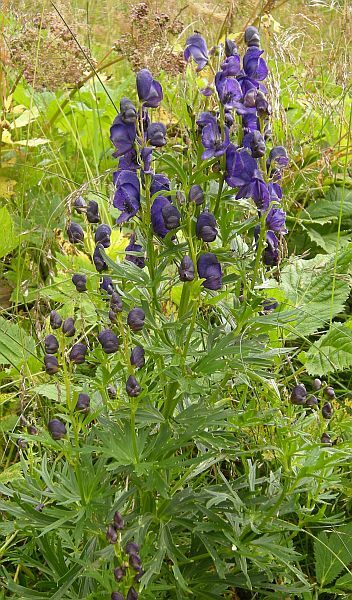 Right next to it I found Europe's most poisonous plant - Monkshood (Aconitum napellus) - which is also a common garden plant. As we climbed higher we entered the forests, which had a dense undergrowth containing Rhododendron hirsutum, a Rhododendron species adapted to lime-rich soils. Another common flowering plant is Scabiosa lucida. Above is one of the many Gentiana species. 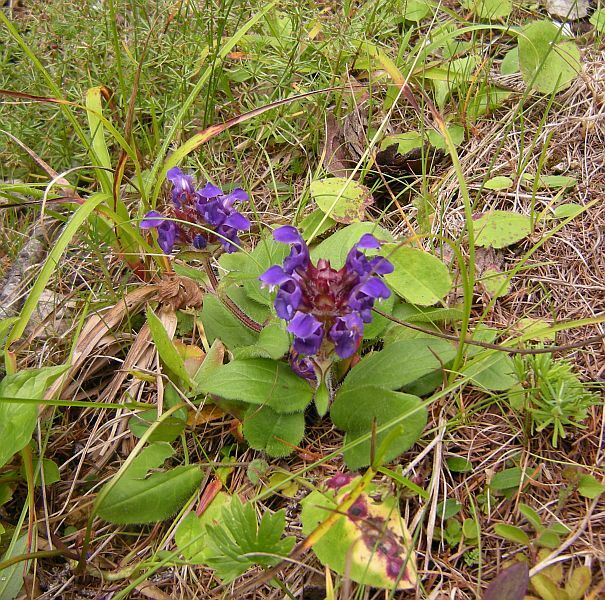 A low-growing flower named Prunella vulgaris. A species of Achillea similar to the common Achillea millefolium, but shorter in habit. At the tree line, plants typical of the high Alps are starting to appear. Phyteuma orbiculare - the devils claw! Aster alpinus - often found in retail nurseries - is a low-growing, summer-flowering aster. Thymus serphyllum, also common elsewhere in Europe. A creeping willow species (Salix). This alpine potentilla (P. nitida) - typical of the Dolomites - has beautiful silvery foliage and pink flowers. Potentilla nitida often inhabits barren limestone slopes. Papaver alpinum rhaeticum - the Alpine Poppy. Leontopodium - Edelweiss - was used extensively as a hat ornament, but is now protected. It is also the star of the song “Edelweiss” in The Sound of Music. This tiny fern growing in a shady rock crevice at over 2,000 meters of elevation is probably an Asplenium species. One of the countless Hieracium species. 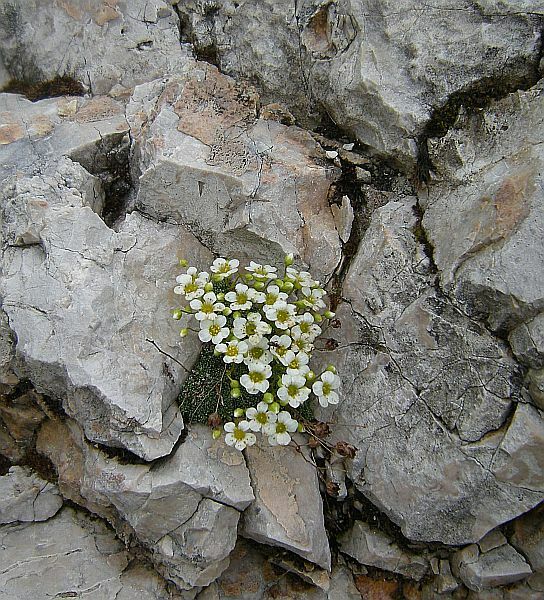 Saxifrages are very common in alpine rock walls. Many species form dense mounds of tiny foliage. This plant is aptly named a Cushion Plant. A tiny saxifrage anchored among some rocks. The alpine bellfowers were some of the most striking little plants that I saw. Pictured above is Campanula cochlearifolia. Lotus and Campanula in a high altitude meadow make for a nice color contrast of yellow and blue. Pictured above is Lotus alpinus, another common alpine plant. Dryas octopetala forms extensive drifts on high mountain meadows. In August, the flowers are gone but it is still beautiful with its fluffy seed heads. This plant was very widespread during the Ice Age, covering the plains of the barren glacial landscape where the Woolly Mammoth roamed. Close-up foliage of Dryas octopetala. In New England the same plant species is found on the slopes of Mt. Washington, and therefore sometimes called Mt. Washington Daisy. The top of Piz da Peres was covered in clouds, so we could not enjoy a wide view over the Alps. But the fog was beautiful in its own way. Starting the way back was like entering into a secretive and mysterious world totally concealed by fog.